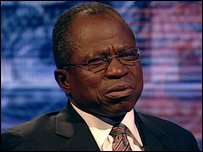 In a HARDtalk programme broadcast on December 17, Stephen Sackur talks to Ojo Maduekwe , Nigeria's Foreign Minister. Nigeria should be one of Africa's most influential nations. It is the most populous, a key player in regional diplomacy and is endowed with large oil reserves. But its influence is curtailed by internal weakness -- a government wrestling with the long-running problem of communal violence and corruption now sees its revenues hammered by a plummeting oil price. Ojo Maduekwe is Nigeria's Foreign Minister. Stephen Sackur asks if his country is in any position to punch its weight in Africa. HARDtalk is also broadcast on the BBC News Channel Mondays, Tuesdays and Wednesdays at 0430 and 2330. All times are GMT.